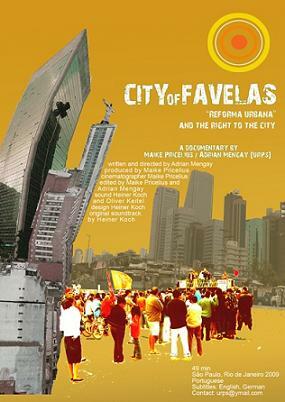 presented by: URPS urban research in participatory struggles, filmmakers Adrian Mengay and Maike Pricelius in person. All across Brazilian cities irregular buildings sprawl, piling up like honeycombs. Favelas and dilapidated houses are a focal point of urban poverty. Departing from a reflection on these precarious places, this film tries to track a different kind of urbanization and takes the viewers into the life of their inhabitants. The film accompanies urban protagonists in São Paulo and Rio de Janeiro and documents political, economic and cultural alternatives to social exclusion..
Favelas can be thought of as a materialization of the social exclusion that affects their inhabitants. Though crowded with people, lacking infrastructure, and manifesting cultural and economical discrimination, favelas are nevertheless places of solidarity and laboratories of political, economic and cultural alternatives. This documentary explores the practices of empowerment developed by various institutions in their struggle for a better life and interrelates issues such as community development, education, social history, favela culture and ”economia solidaria”.